Gretchen Ernest Brigden ’89 remembers the dread she felt on the day of her calculus exam. She didn’t know she had dyslexia, a learning disability that can impede the ability to work out math problems on paper, even when the answer is known. She only knew she’d worked very hard with her tutor but still couldn’t figure out the proofs. “We all have dreams about failing, and mine are about calculus,” she says, recalling that vivid moment—one of several that, ultimately, helped her learn to overcome obstacles along her path to success. The first in her family to attend a residential college, Brigden visited 20 schools during her junior year of high school and found a warm welcome at Dickinson. She declared an economics major sophomore year and got involved as a resident advisor and with the ski club, Omicron Delta Kappa and Delta Nu. She also attended a national Habitat for Humanity conference in Atlanta, with support from Dickinson, and established a campus chapter. Gretchen Brigden '89. Photo by Wayne Armstrong. By the end of the summer, she’d learned to trust in herself. She also saw the world as a big place—and realized she may need to search to find a home and workplace that fit her. During her first job, as an accountant at Prudential, she realized that the rigid world of big-corporation accounting wasn’t for her, and put that lesson into practice. Continuing to work hard, Brigden did some soul-searching. By 1995, she’d earned her M.B.A. from Duke University’s Fuqua School of Business and launched a finance career. Brigden served as vice president of Deutsche Bank Securities and vice president and portfolio manager of Merrill Lynch, and as Ambac’s first vice president of commercial asset-backed securities and emerging markets. She and husband Julian were living in New Jersey and working in Manhattan, in different areas of finance, when the markets crashed. In 2011, she and her husband co-launched Macro Intelligence 2 Partners (MI2Partners), a macroeconomic research company. She is COO, while Julian focuses on research. They now employ a team of eight. With the company growing, Brigden reconsidered where she wanted to be. Technological advancements like videoconferencing made it possible to work outside of Manhattan, and she and her family had been enjoying vacations in Vail, Colorado, for years. Brigden also knew that the Vail schools were excellent—a vital consideration, as daughter Molly was diagnosed with dyslexia. Three years later, the Brigdens love living in Vail (and the former Dickinson Ski Club co-captain hits the slopes when she can). Brigden still keeps in touch with Dickinson sorority sisters, classmates and ski-club friends, and she’s attended several class reunions. 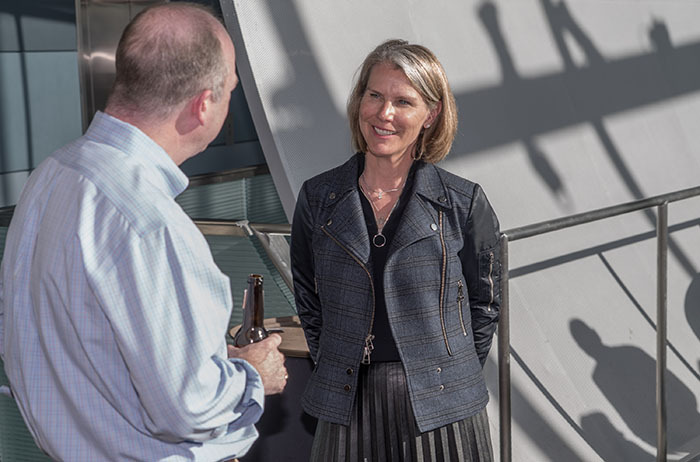 She recently hosted a Denver alumni event, as part of President Margee Ensign’s Useful Education for the Common Good Tour, and she supports Dickinson as a Mermaid Society and John Dickinson Society member. Last December, she established the Brigden Family Scholarship Fund. As her 11-year-old nears high school, Brigden says she and Molly talk often about how to navigate the inevitable challenges ahead.